Poetry prizes won by M. Travis Lane include the Mary Harding Baylor Prize 1952, Northern Light 1975, the Pat Lowther Memorial Award 1980, Arc 1982, Fiddlehead 1991, New Brunswick Writers’ Federation 1994, Amethyst Review 1997, the Atlantic Poetry Prize 2001, the Alden Nowlan Prize for Excellence 2003, and the Banff Centre Bliss Carmen Poetry Award 2006. She is included in The Dictionary of Literary Biography: Canadian Writers Since 1960, ed. by W. H. New, and is listed in both the New Brunswick Library Encyclopedia and Atlantic Canadian Poets’s Archive. Her work is included in over two dozen anthologies. 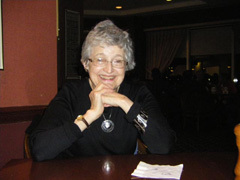 She is a Lifetime Member of the League of Canadian Poets and Honorary President of The Writers Federation of New Brunswick. As soon as I could print. My family all loved poetry and liked to recite it and to read it to us. They recited poems or sang songs while doing housework or when taking long drives in the country. My father, my aunt, and my sister all wrote poems, and my mother wrote stories. I wrote poems in grade school. My first poem was published when I was eleven (in the local newspaper. What inspires me? Everything: nature, science, the news, art, music, something someone has said, most of all, other poetry. When I write a poem, I think a lot about how it sounds, and I revise a great deal in order to get the sound right for the subject. “What Can Be Named in Numbers” started because I had been looking out my window and admiring the beauty of an insect’s flight. I wanted to write a poem that would reflect or imitate that beauty. Then I decided that this line was not a good first line for the poem; it is more like an ending line. I did still want to start with a basic five beat line, but something less melodious. Then right after the introductory line I wanted to change the sound altogether—no more five beat lines, but something sort of flat or bang, bang- ish. I wanted to use real numbers: not “five” but “5.” And, as a contrast to the insect’s flight, I wanted something rectangular. Then I do a zigzag of my own. Instead of going on to say how beautiful all this is, I change the direction of the poem and ask, does this beauty require us in order for it to be beautiful? Since poetry is not a science, any teacher, web site, or book, that tells How to Write a Poem is just offering one person’s opinion. Another person might have a very different opinion. The best way to learn about poetry is to read it: begin with the famous Great Poems and with the famous Popular poems, and then go on to read new poems, silly poems, serious poems, song lyrics, everything. Taking a course in literature is a good way of discovering new poems. I think it helps when schools can get local poets who can read their work out loud well to read their poems for the students. A lot of students have never learned how to hear what they read, so hearing a poem properly read can show them what the pleasure of poetry can be. It would also be helpful; if teachers could be taught Not to say “What is this poet trying to say?” A poem is not a code. The point of all poems is the fun of saying, the style, the liveliness. Messages are for prose. Poetry is more like dancing. Some people are convinced that good poems are difficult. Generally what makes a poem “difficult” is either that the poem refers to stuff the reader has not yet heard of, or the poem suggests ways of thinking that are unfamiliar to the reader. A new way of looking at things often seems, at first, “difficult.” But we never learn anything if we avoid the unfamiliar. The more widely we read the easier reading gets. Most writers benefit from finding other writers to make friends with, to read or listen to their words, with whom to share their writing. Some families and some communities regard poetry as strange, and beginning poets can be made to feel very lonely. In situations of this sort, local poetry groups in schools or outside schools can be very helpful. We all need friends who share our interests. A group of writing friends can put on an “open mike” performance for each other or the public. They can get together and computer-publish their own writing. Working together they will help each other, edit each other, make useful suggestions, and form a local audience for their material. High school and college magazines are very helpful to get people started on a writing career. Often local published writers can be invited to help out or attend performances. I would urge any beginning writer to get in touch with the local writers groups, or to join with a friend in creating such a group. Published in Canadian Literature 191 (Winter 2006): 47-47. Published in Black Writing in Canada . Spec. issue of Canadian Literature 182 (Autumn 2004): 11-11. Published in Nature / Culture . Spec. issue of Canadian Literature 170-171 (Autumn/Winter 2001): 20. Published in Canadian Literature 169 (Summer 2001): 102-105. Published in Remembering the Sixties . Spec. issue of Canadian Literature 152-153 (Spring/Summer 1997): 205-205. Published in Remembering the Sixties . Spec. issue of Canadian Literature 152-153 (Spring/Summer 1997): 208-208. Published in DeMille’s Utopian Fantasy . Spec. issue of Canadian Literature 145 (Summer 1995): 19-19. Published in DeMille’s Utopian Fantasy . Spec. issue of Canadian Literature 145 (Summer 1995): 20-20. Published in Background, Foreground . Spec. issue of Canadian Literature 127 (Winter 1990): 38-39. Published in Shaping Texts. Spec. issue of Canadian Literature 119 (Winter 1988): 7-7. Published in Atwood, Carrier, Grandbois, Lowry. Spec. issue of Canadian Literature 112 (Spring 1987): 29-29. Published in 25th Anniversary Issue. Spec. issue of Canadian Literature 100 (Spring 1984): 183. Published in Wilson, Laurence, Gallant, Glasco . Spec. issue of Canadian Literature 93 (Summer 1982): 58. Published in Fiction in the Seventies . Spec. issue of Canadian Literature 92 (Spring 1982): 45. Published in Canadian Literature 214 (Autumn 2012): 30. Published in Canadian Literature 214 (Autumn 2012): 14. Published in Contemporary Poetics . Spec. issue of Canadian Literature 155 (Winter 1997): 197-200. Published in Nature, Natural, Naturalists. Spec. issue of Canadian Literature 111 (Winter 1986): 180-182. Published in Caribbean Connections . Spec. issue of Canadian Literature 95 (Winter 1982): 154-156. Published in Contemporary Poetics . Spec. issue of Canadian Literature 155 (Winter 1997): 201-202. Published in Poets & Politics. Spec. issue of Canadian Literature 105 (Summer 1985): 59-68.